Model 725DM Multiscreen is a heavy duty trommel screen quality engineered for the high production, high volume compost facility. It sets the standard by which all other screening systems are measured. It features a 115 horsepower turbo John Deere liquid cooled diesel engine, four cubic yard holding bin, 36" wide infeed belt, 72" x 86" trommel screen, 48" hopper metering belt, standard rejects/overs conveyor and 36" wide and 30' long folding belted conveyor, fifth wheel, dual axles and air brakes. 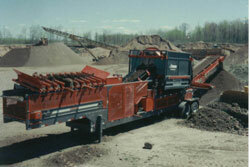 Multiscreen now offers greenwaste managers the most efficient soils screening system for the money. In high moisture condition the new Model 725DM Multiscreen Soils Screening System can't be beat. The 725DM Multiscreen exclusive patented offset shaft mounted flexible flail hammers and patented hydraulic powered (13" diameter) cleaning brush inside trommel screen is what separates Multiscreen from all other competitive trommel screens in the market. The 32 belted flail hammers minimize the rejects and dramatically increase the efficiency when screening high moisture composted organic material. Our secret is as the trommel drum (shortest in the industry) rotates one direction the offset hammers shaft is rotating in the opposite direction, causing organic material to be pulverized and aerated as it passes as fines through the trommel drum. As the clumps and clods of the organic material are broken apart unscreenable hard objects like rocks and wood debris will continue to travel through and are rejected to the overs conveyors. The 725DM Multiscreen virtually eliminates the need to run your organic material through the screening process twice. The new 725DM Multiscreen will give you the high quality screened and pulverized organic product you demand. For further technical information on the new 725DM Multiscreen and the dealer nearest you contact Multitek, Inc at 1-800-243-5438 or visit us on the web at www. Multitekinc.com. Multitek, Inc, 700 Main St., PO Box 170, Prentice, WI 54556-0170. Tel: 715-428-2000; Fax: 715.428.2700.